Much of the dining in Jakarta is highly visible on the street and at the markets, where some of the best deals and tastes can be had. There is, of course, Western-style top-enders in the touristy areas of South Jakarta and in the star-rated hotels, while fast food can be had at the likes of McDonalds and Pizza Hut. Jakarta shopping options range from cheap, pirated tack up to the best high-end merchandise in swanky department stores. Getting about and finding the best spots cam be tricky, however, although when you know where to go, shopping in Jakarta can be a pleasant experience. Indonesia's capital has a wealth of sights, attractions and landmarks to check out that range from historical streets to mega religious structures and monuments. 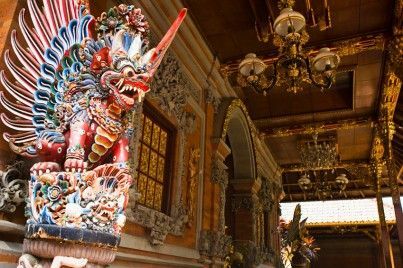 Although there is much to see, Jakarta is not overrun with sights and is not as overwhelming as many other Southeast Asian centers. Jakarta is a noisy and chaotic metropolis and there are cautions to be aware of as with any large urban center. While it can be a headache and the weather decidedly muggy, it can also be lots of fun if you know what you're doing. More on Jakarta travel tips. Jakarta covers most types of interests in the entertainment department. There are many lively streets for party-goers, a waterfront entertainment complex nearby that comes complete with a beach, and plenty of museums and cultural attractions.